Alabama vaulted to the top of the College Football Playoff rankings this week after handily beating Mississippi State and now the Crimson Tide are the heavy favourites to win the national championship according to Nate Silver’s model. 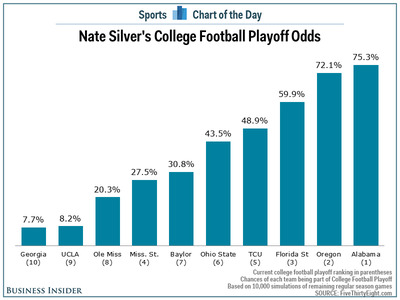 While the top three teams in Silver’s model match the top three in the playoff rankings, Mississippi State, the no. 4 team in the rankings, are a surprise dropping all the way to no. 8 in Silver’s model. The model, which is based on 10,000 simulations of the rest of the season, has a slightly different take on the teams with the best chance to be in the first college football final four. Earlier this week we looked at the top nine teams and how each can still make the playoff. According to the model, ten schools still have a legit (greater than 5%) shot to make the final four with TCU slightly ahead of Ohio State even though the latter actually has slightly better odds to win the title.